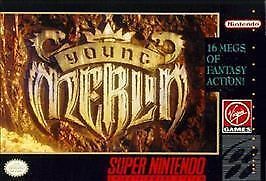 Young Merlin for Super Nintendo allows you to guide the young sorcerer through 10 challenging worlds. Along the way, he'll have to fight a variety of goons and goblins. There are also several mind-bending puzzles that to be solved in order to progress. All of the action is created with tons of animation and a cutting edge 3D multi-plane system.